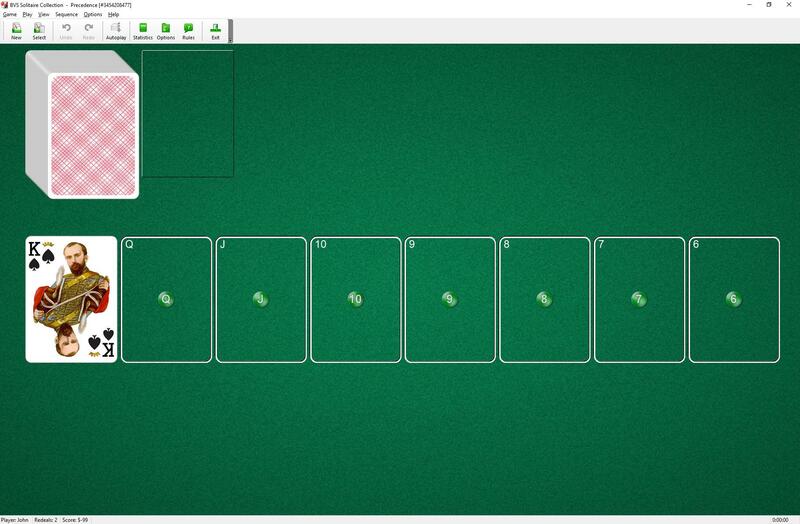 Precedence Solitaire uses 104 cards (2 decks). A King is dealt from the stock pile and placed face up at the left end of a foundation row. 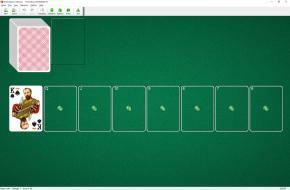 Seven other foundation cards - Queen, Jack, 10, 9, 8, 7, 6 of any suit are placed in the foundation row as they become available. Foundations must be moved up in the given order. For example, foundation 10 cannot be placed until foundation King, Queen and Jack are in place. To build the foundations down, regardless of suits, until each pile contains thirteen cards, wrapping from Ace to King as necessary. The top card of the waste pile is available to play on foundations. Turn cards over from the stock pile to the waste pile.